Pillow valves give a smooth performance and prevent piston from hitting inner walls of the cylinder. Durable extruded aluminum body can be used on variety of tailgate applications. Offered in a variety of sizes, cylinders have a clevis style mount. 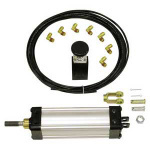 Keep your tailgate operating smoothly with Buyers Products Tie Rod Cylinder Kit. Each cylinder houses and protects an enclosed tie rod in a durable extruded aluminum body. Kits include everything to install the tie rod cylinder, including air valve and tubing. The cylinders are ideal for dump truck operators to engage and disengage tailgate latches from inside their vehicle without having to leave the cab.